No need to go to Maine for scrumptious blueberry preserves. Check your market shelves for Trappist jams. The Blueberry Preserves is so good that each time I use it I feel as if I’m in a B&B being served the finest breakfast. It’s thick with whole blueberries and is so full of real fruit, your lips will turn blue, just like they do with blueberry pie! If you can’t find the Trappist line of jams on your grocery shelves, you can mail order through Monastery Greetings. Here’s what you’re looking for! Yummy! 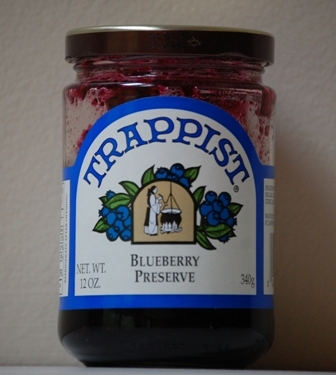 Almost time for more Trappist Blueberry Preserves!